Soooo...this is basically a huge pot of kale soup (or Swiss chard, but I used kale). Which isn't a bad thing. But unfortunately, it's slightly lacking in flavor. Maybe it's because I used tomato juice instead of the suggested tomato puree? Or maybe it's because I used kale instead of Swiss chard, which probably would have added a little more bitterness to the soup? 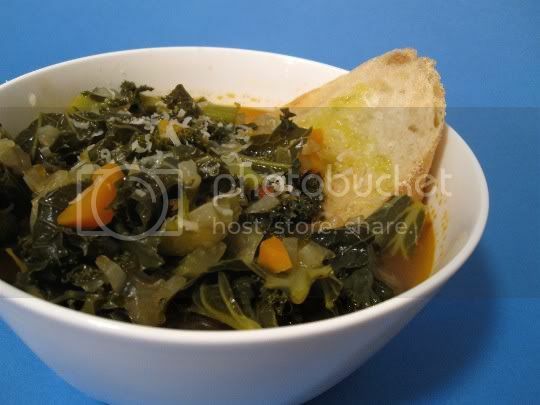 Or maybe it's because this is nothing more than kale, onions, celery, and carrots cooked in a tomato and water mixture? That's right, vegetable stock isn't even used in this recipe. The only flavoring comes from a small amount of tomato paste and, something interesting, a piece of Parmesan rind (yes, the cheese). This adds a bit of richness, a bit of saltiness, and a bit of that Parmesan "meatiness." But, just a bit. There's also a little heat from added crushed red pepper. I am guilty for forgetting to salt and pepper the soup after it cooked, as the recipe suggested...so you'll definitely want to make sure you do that. Fortunately, the Italian bread slice, olive oil drizzle, and grated Paremsan on top do help to round out the meal and the overall flavors in the end (as well as provide a pretty presentation). And who doesn't like the hearty, robust, mildly sweet taste of kale? I guess that's at least something to look forward to. Make again? Probably not. Don't get me wrong: it's a good dish and filling meal. But it's a bit to plain for my likings, extra salt or not. Looks delicious, when can I taste it.